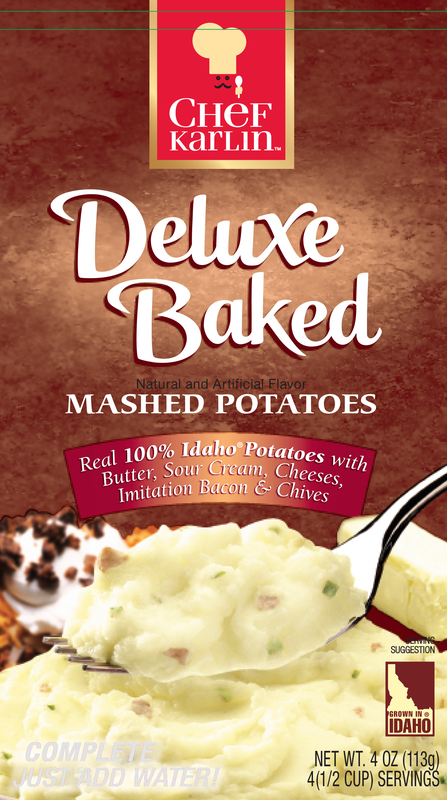 Ingredients: Potatoes*, Salt, Butter (Cream, Salt, Buttermilk), Sour Cream [Milk Fat, Nonfat Milk Solids, Corn Syrup Solids, Whey (from milk), Cultures, Sodium Silicoaluminate, Lactic Acid], Canola Oil, Natural Cheddar Cheese Flavor [Natural Flavors (includes milk), Maltodextrin, Whey (from milk), Dipotassium Phosphate], Parmesan, Blue Cheese, and Romano Cheeses (Pasteurized Milk, Cultures, Enzymes and Salt), Corn Syrup Solids, Imitation Bacon (Soy Flour, Caramel Color, Soybean Oil, Salt, Natural Flavoring, Red 3), Onion*, Chives*, Spice, Mono- and Diglycerides, Natural and Artificial Flavors, Sodium Caseinate, Sugar, Disodium Inosinate and Disodium Guanylate, Titanium Dioxide (color), Soy Lecithin, Dipotassium Phosphate. Freshness preserved with Sodium Acid Pyrophosphate, Sodium Bisulfite and Citric Acid. Measure 2 cups boiling water into a serving bowl*. Add contents of pouch and stir with a fork to moisten all of the potatoes. Let stand about 1 minute until liquid is absorbed. * For creamier or thicker texture add more or less water. In a microwave-safe bowl, add 2 cups cold water and stir in contents of pouch*. Microwave on HIGH 3 to 4 minutes or until hot.